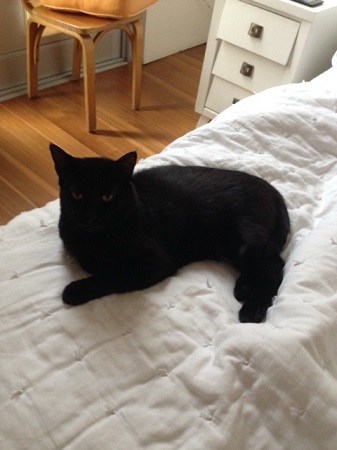 He is a male cat about five years old and as fit as his name suggests. Just a few months ago he was without a home and had an injury; neighbors rescued him and he now has a clean bill of health including all of his shots. He is like a dog that does not require walking (likes to be right by his owner’s side). Very gentle and appreciative and smart as a whip! Perfect understanding and use of his litter box. He is quite content to stay indoors; no escape attempts or whining . He is living now with another cat and also a large dog; it took a few days to work things out with the dog but that little snag was just as much about our dog viewing Bulldog as an interloper. They now get along fine. For more information fill out an application at a pixieproject.org so we can schedule a meet! He is fixed, vaccinated and microchipped. His adoption fee is $100.